I completed a trade with Judson, from the blog "My Cardboard Habit" when I sent him a bunch of Rangers stuff, including a Rougned Odor auto, in exchange for some really awesome stuff. Judson sent a bunch of parallels I needed for various PCs, which I didn't scan. 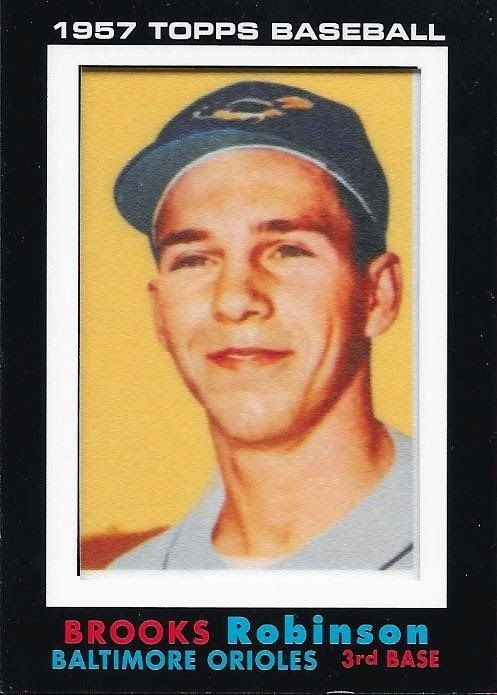 What I did scan was this really cool Brooks Robinson silk rc from 2014 Topps. I have had a bunch of folks offer this to me at ridiculous prices, and I am glad that I held off buying one. I figured I would get one via trade eventually. 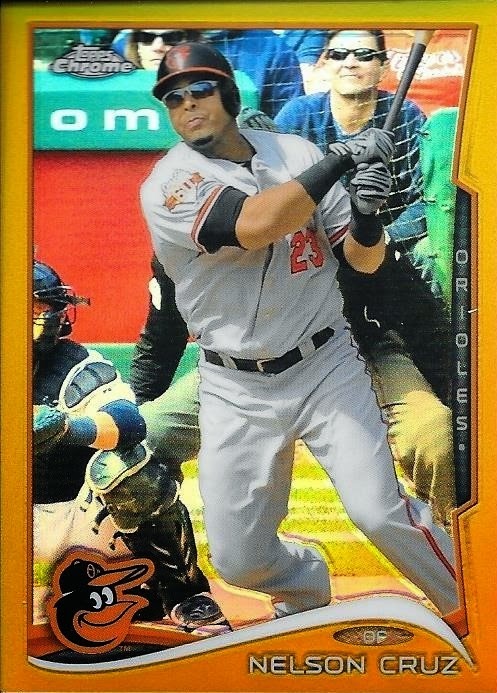 One of the parallel cards Judson included was this Nelson Cruz 2014 Topps Chrome gold parallel. 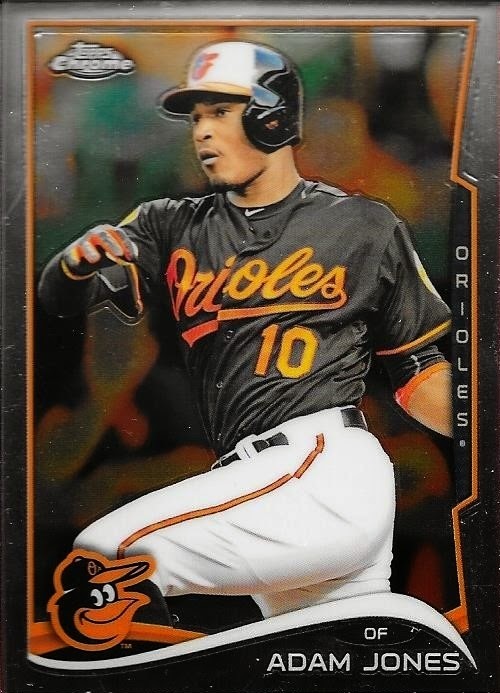 Cruz is likely out of Baltimore after just this one season, but he had a great year with the Birds, and I probably will passively pick up a few of his cards here and there. Finally, Judson also helped a little with some set needs. He included 9 1969 Topps cards for my set. Most of them being high numbers. I haven't pushed as hard for this set, since I have been majorly focused on my 1959 set, but I am still chipping away at this one as time and money allow. Thanks for the deal, and all of the extras, Judson! For $35, I got 5 cards off of my friend, Rob, for my 1959 Topps set. The cards are all decent names, two of which are Hall of Famers. I got the above Harmon Killebrew, which is in great shape, along with Norm Cash, Bill Skowron All Star, Frank Malzone All Star and Bill Mazeroski All Star. Malzone has a bit of wax staining across his face, but otherwise, the cards are in great shape. Rob always hooks me up with great vintage set needs. If you have Instagram, check him out, @vintagebaseballcardsforsale. Thanks for the deal, Rob, I appreciate it. I now need 85 cards to finish my 1959 set. The end is near! I hope everyone had a great Thanksgiving. I missed posting last night because I cooked all day. This year, I cooked the turkey, ham, German potato salad, deviled eggs and pinto beans while my wife was at work. When she got home, she took care of the rest of the sides. We hosted my two younger brothers and their respective lady-friends. We watched a bunch of movies and had a great time. 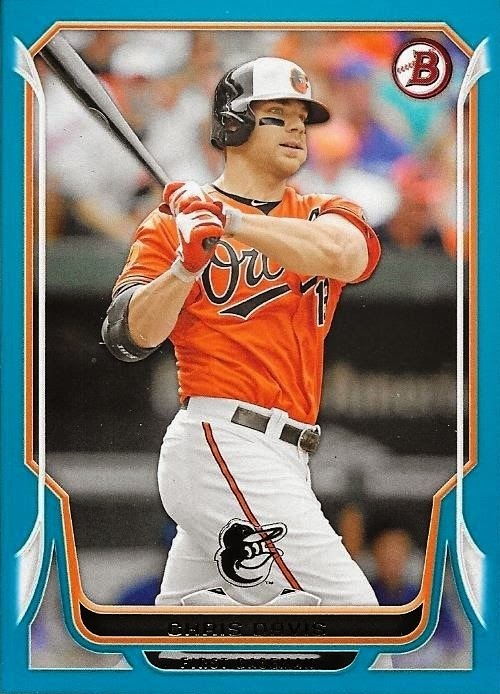 I wanted to get a post up really quick today, so I picked this Chris Davis that I've had queued up for a little while. I got it off of ebay for a few cents. It is numbered 489/500. I like the Bowman parallels. I think this is the only Davis parallel I have out of this year's Bowman. I need to look for a few more, but I've been swamped with Christmas shopping. I'll have to look again after Christmas is over. I got a stack of cards in a familiar mailer in my mailbox the other day from my good friend, Andrew. He and I pass the same bubble mailer back and forth when we send each other cards. The poor thing has some mileage on it, for sure. 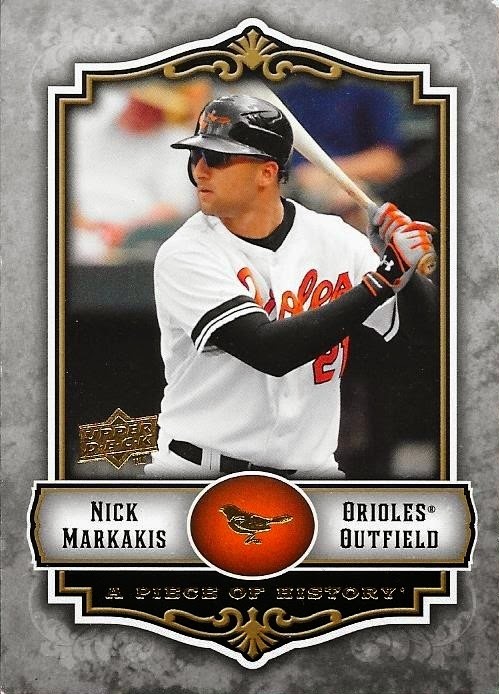 This time around, Andrew sent me this awesome Nick Markakis relic along with a bunch of other Orioles and random inserts. I was sent this Markakis in another trade, but I'm glad I have them. Thanks for the package, Andrew, I really appreciate it. I completed a trade on Instagram recently with a kid named Jacob. He has a eclectic mix of players that he PCs, highlighted by Mark Buehrle. 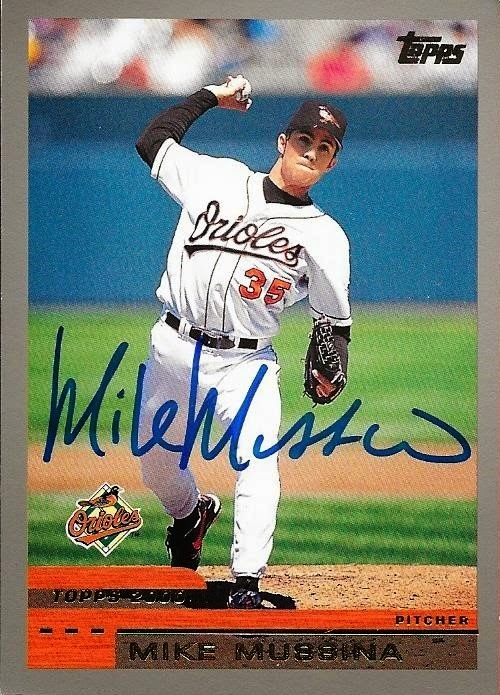 I found him quite a few of the guys he liked and in return he hooked me up with some really cool cards like this 2000 Topps Mike Mussina TTM auto. 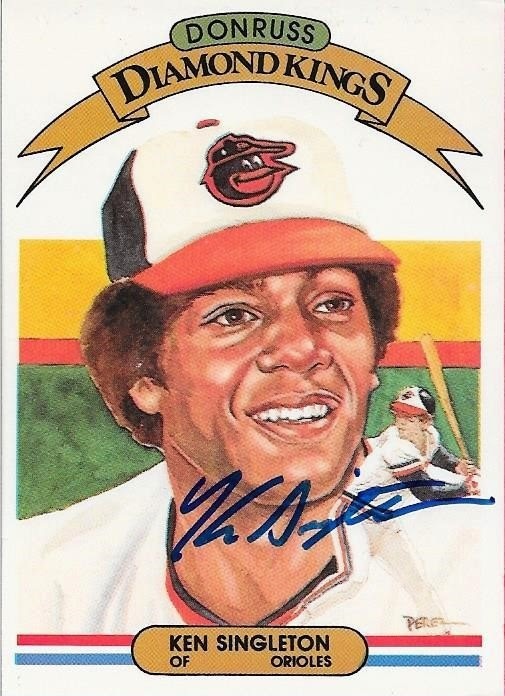 I don't normally go for other folks' TTM autos,but since he offered it, I decided I'd take it. I really liked this Ken Singleton Diamond Kings auto as well. These cards look really awesome signed. I forgot to ask Jacob if this was a TTM or IP auto, but regardless, it's really cool. 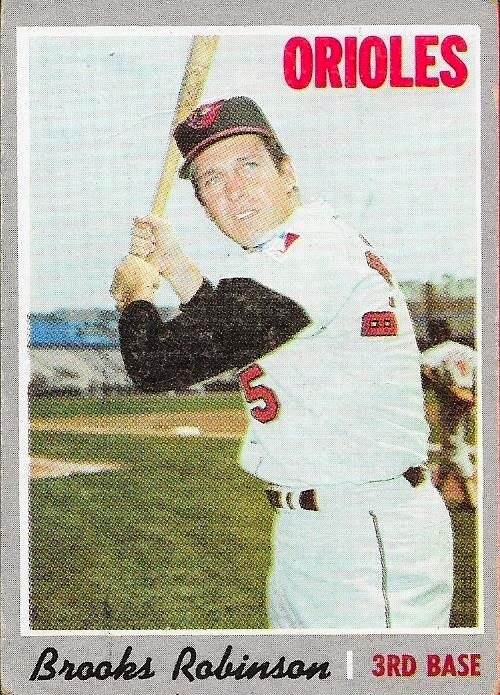 Finally, I picked out this 1970 Topps Brooks Robinson from Jacob, even though I already had it. You can never have enough vintage Brooks cards. It is in decent enough shape. I didn't feel like I was in a position to complain since Jacob was nice enough to include it. Thanks for the trade, Jacob! I really enjoyed our discussion over the deal and I know we will trade some more. 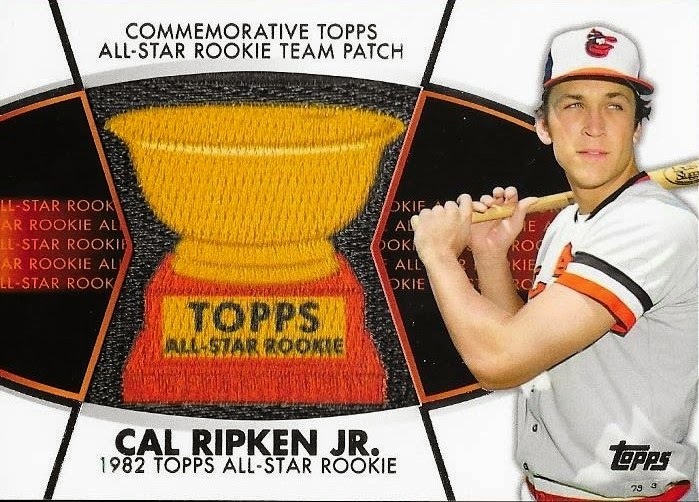 I got a surprise package in the mail yesterday from my friend, Ryan E. that had this really cool Cal Ripken manufactured rookie cup patch from 2014 Topps. Ryan said that it was a late birthday present, which was really nice of him. I chat with Ryan from time to time; he is the cousin of fellow blogger, Matthew. I thought it was really cool of Ryan to think of me, regardless of the time of year. The best part is that Ryan was able to find a Cal card that I didn't already have in my collection. He definitely gets a gold star! Thanks so much, Ryan. I think these manufactured patch cards are cool, even though others hate them. To each their own, I guess. I completed a trade on Instagram with my good friend, Jet, for some extra 1954 Topps cards that he had left over from when he put his set together. I can't remember what I sent him, but in return he sent me 6 1954 Topps cards, and a few other things. I plan on hoarding these 1954s until I can begin the set sometime in the future. I don't know when that will be, but hopefully it will be soon. 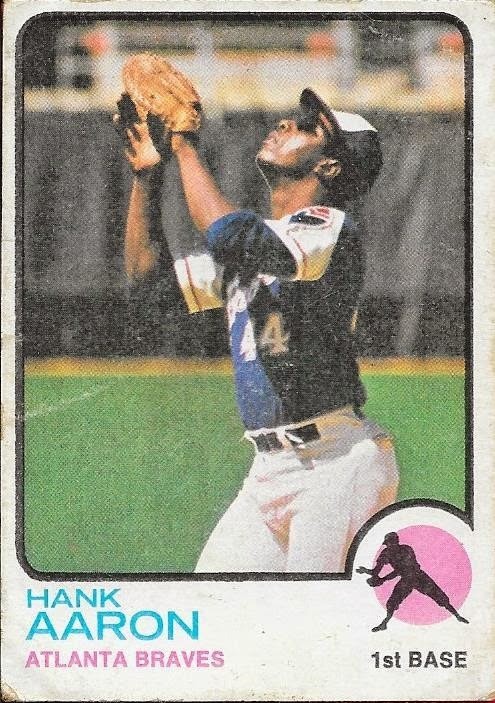 One of the extras Jet sent was this 1973 Topps Hank Aaron. It is a bit lower grade, but still a nice card. 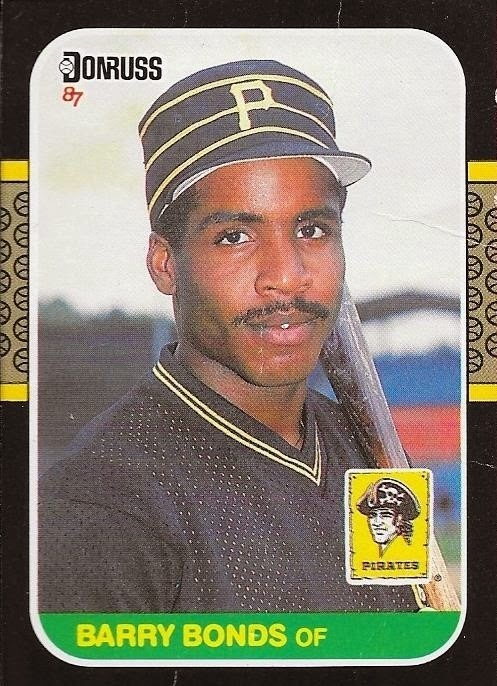 Jet also included this beat up Barry Bonds rookie card. It has some creases, but is still a cool card. Funny how small Bonds's head was back then. Thanks for the deal, Jet, I really appreciate it! I completed a set, finally, that I have been working on for a while. I got the last few remaining cards I needed off of Sportlots so I could finally put this one to a close. I should be finishing up two other sets really soon (2014 Update and 1997 Topps), so be on the lookout for those. I went on a Sportlots binge twice in the last two weeks and grabbed a bunch of cards to help me with set needs. I got enough cards to wrap up a few sets that have been kind of twisting in the wind, recently. One of those sets is 1997 Topps. I picked up 35 cards that I needed, leaving me one remaining to complete the set. The card that I have left is on its way from my friend, Max. Once I finish 1997 Topps, I will work on completing 1994, then turning my attention to 1995 so I can wrap up all of the recent issues of Topps. Once those 90s sets are completed, I will have a straight run of sets from 1973 to 2014. 1972 is keeping me from having a run from 1970 to 2014, but I haven't started that set, yet. I'll probably start '72 once I finish 1969, which is not too far from completion. Awesome Mail Day From Michael S.
I got a sweet mailday today from my friend, Michael S. off of Instagram. He and I worked out a deal for a Jeff Bagwell jumbo relic that I had finally gotten in from a kid who almost got away with not sending cards to me. Luckily, I got the relic and in turn flipped it to Michael in exchange for a card that is shown lower on this post. That's right, Michael included this Brooks Robinson 2005 Fleer cut auto (at least I think it's a cut auto) that is numbered 21/25 to me for free. He made a point to tell me that it was very difficult to part with the Brooks because it was a gift to him from his father, and being the family man that Michael is, he really values anything that has that kind of connection to him. Michael told me that he sent me the card because of all of the things I have done for him and others in the trading community. While I don't feel like I'm all that special (one of my favorite quotes from another friend of mine is "You ain't special"), the gesture is most appreciated. 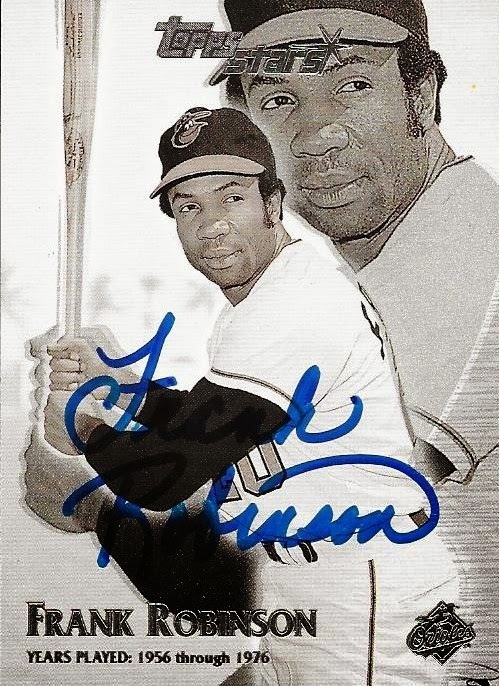 As if the Brooks wasn't enough of a gift, Michael shifted his generosity into overdrive and sent several other Orioles autographs, including the above Frank Robinson auto. I feel like this Frank is a TTM or IP auto, but it is legit. These Topps Stars cards look really nice signed in blue Sharpie. Here is the actual card I traded for. 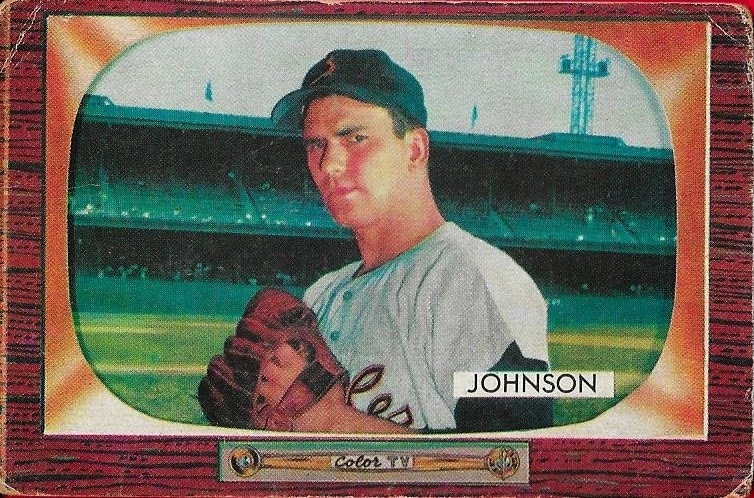 This is a 1963 Topps Gaylord Perry "Rookie Card." 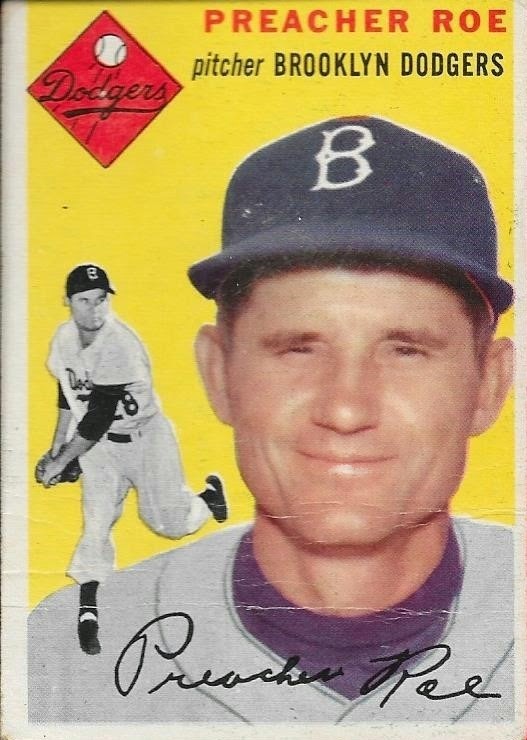 I use quotes around Rookie Card because his true RC is 1962 Topps, even though this one lists him among Rookie Stars. The card is still really cool and I was glad to be able to pry it away from Michael. 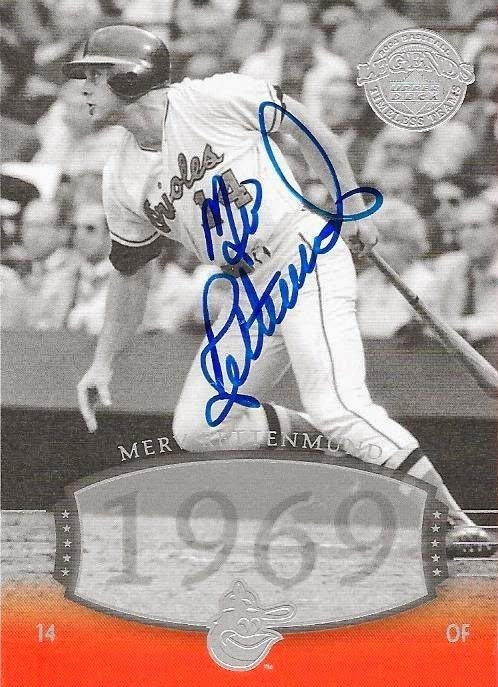 Back to the Orioles autos, Michael sent this nice Merv Rettenmund auto. Rettenmund has a really nice signature. Here is another Orioles legend, and former manager, Davey Johnson. 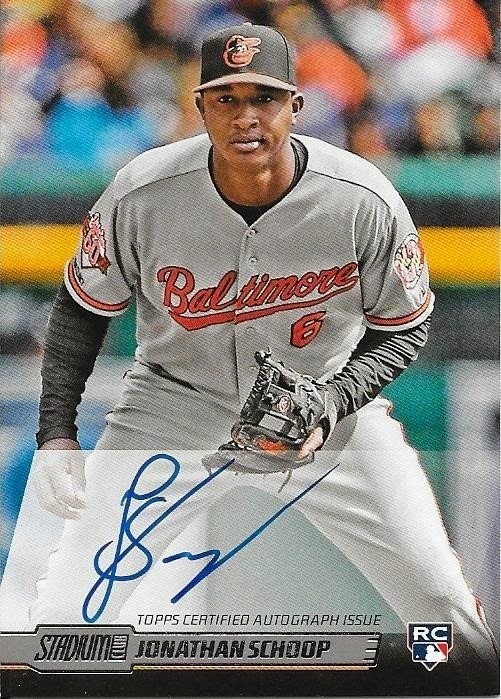 He's someone whose auto I have been wanting on a ball for a while, since he was a former O's manager, but for now, I will settle for this card. 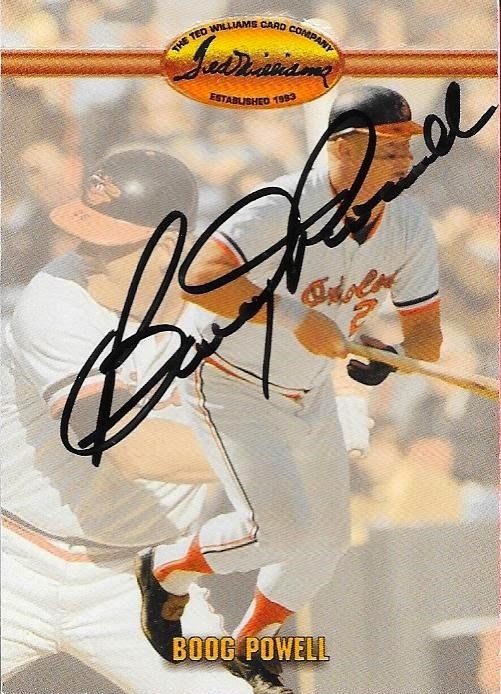 Finally, I got this Boog Powell auto. I have met Powell twice now and he is such a nice guy. I wish he could have had a longer career so there would be more Hall of Fame talk for him, but sadly, he just doesn't have the numbers to back up his candidacy. Thank you so much for the deal, Michael! The autos and extra Orioles cards really were a surprise. I appreciate the gift and the kind words! 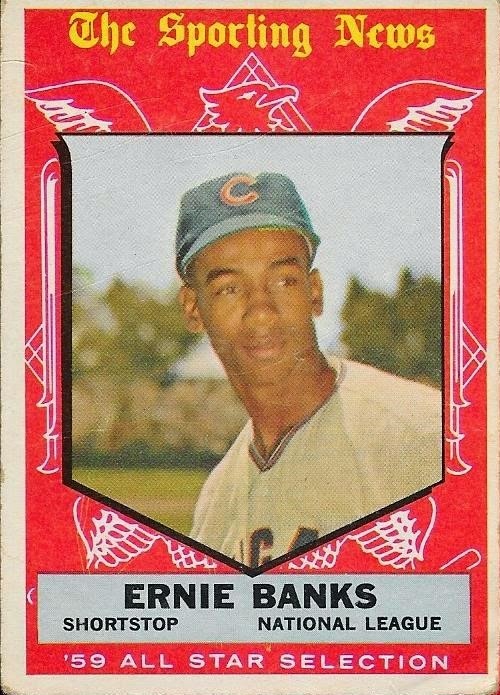 Continuing a string of 1959 Topps cards that I have picked up recently, I am showing this 1959 Topps Ernie Banks all star card that I got off of Ebay for $11.00. The card has a little bit of scratching on it, but thankfully, it isn't too noticeable. Also, the corners are a little soft. I got a sweet deal on it, and I now need 90 cards to complete my set! I completed a trade recently on Instagram and Skype with a guy from Michigan named Noah. I sent him a few Tigers relics (of note, one was a Torii Hunter Golden Moments relic numbered 1/99) and a Nick Castellanos Finest auto. 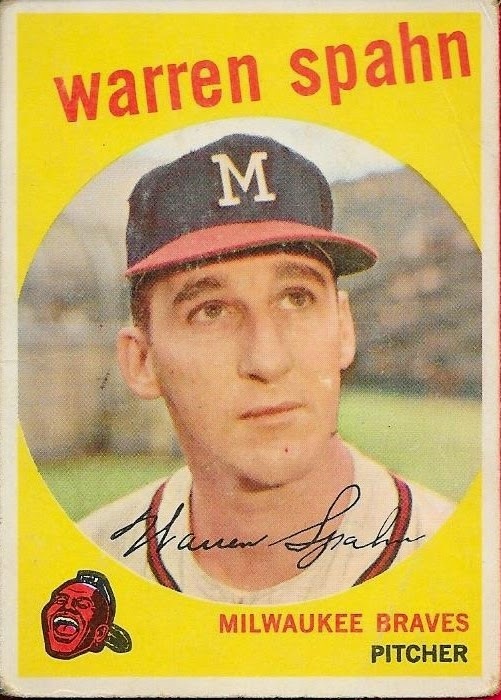 In return, Noah knocked this Warren Spahn off of my 1959 Topps set. This is the "1921" version of the card. There is an error version that has Spahn's birth year as 1931. Another version has 1931, but the 3 is obscured (thanks Rob). This version of the card is in pretty good shape, with a little bit of damage on the right site. Not quite a crease, more of an indentation. It fits right into my set, though. 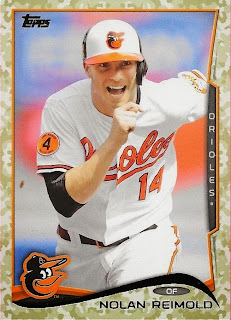 Noah also hooked me up with the Orioles Wild Card win card from 2013 Topps; an emerald parallel version for my set. I can't believe I didn't have that one yet! Thanks for the trade, Noah! I'm glad we have this one complete, now we can work on more deals! Check out Noah's blog here and also his YouTube +NoahJohns _INC. I knocked out a really cool card for my 1959 set today when I got this Roy Campanella card in the mail. 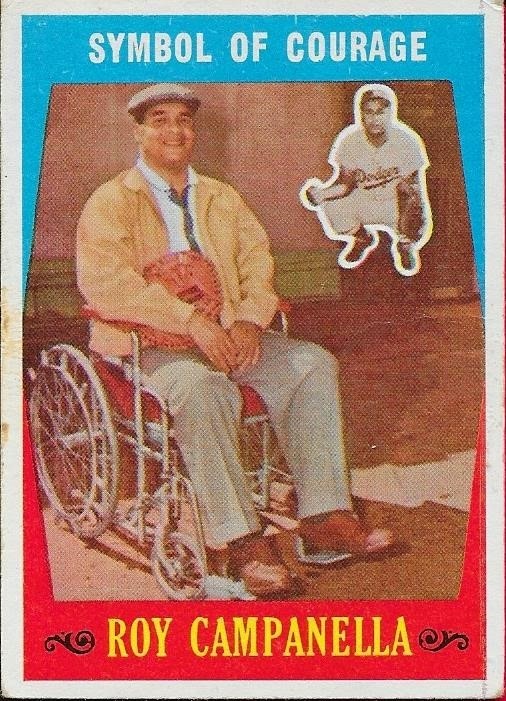 Campanella was paralyzed in a car accident on January 28, 1958,thus ending his playing career. 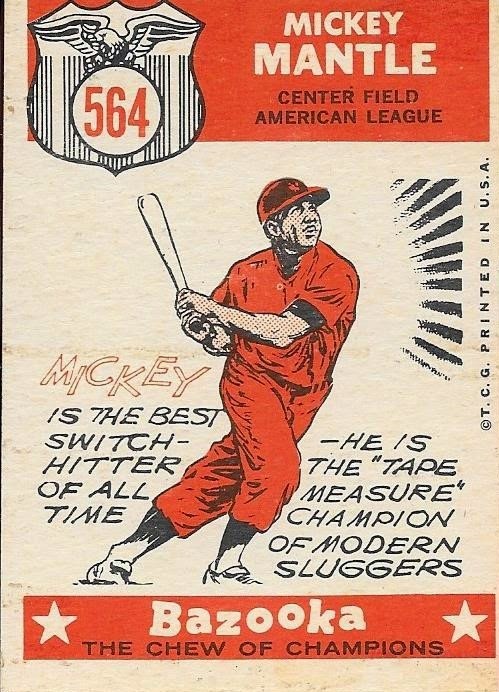 I had forgotten this card was part of the 1959 set until I saw this listed among a few other '59s in some suggestions from Ebay (thanks Ebay!). I'm glad I picked it up, and I got it for a good deal. 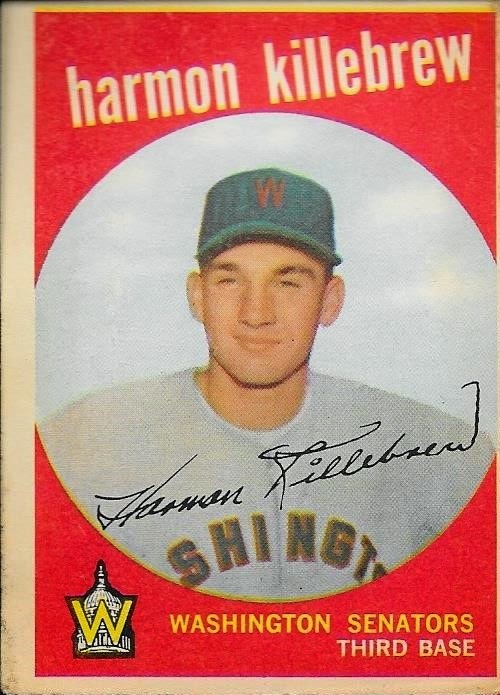 I will now need 92 cards to finish the 1959 set and I have a few others on the way. I've got to keep pushing on this one, so I can get it finished soon! So, What is a High Number? I have been asked numerous times about what it means when someone refers to a "high number" when building vintage sets. High numbers refer to those cards from vintage sets that were issued by Topps prior to 1974 that are toward the end of the set. When Topps used to issue card sets, they would issue them in several different series throughout the season. By the time the later series would come out, they would be issued toward the end of the year when other teams had been eliminated and only a select few were still in contention. This would cause kids' interest in collecting the cards to wane and not as many packs of cards would be sold. Not wanting to be stuck with all of the unsold inventory, Topps would gather up the unsold boxes and packs of cards and they would destroy them. Many folks are familiar with the fact that Topps dumped a bunch of 1952 Topps cards in the Hudson River. This is one of the many reasons why the 1952 Mantle is so expensive. It can be chalked up to simple supply and demand. The card is really sought after and due to the limited supply, the value of the card has gone through the roof. This high number issue affects all set builders who enjoy vintage sets. The problem stops following the 1973 Topps set because, in 1974, Topps only issued the cards in two series, and some times, one series (like 1988 or 1989 Topps). Hopefully, this helps explain, somewhat, about the high numbers. You can tell which cards are the high numbers in a set by checking a beckett checklist, or checking online on cardboardconnection.com. ****By the way, today marks the 6th anniversary of my blog. if you want a fun read, travel back in time by clicking this link and read my first entry. 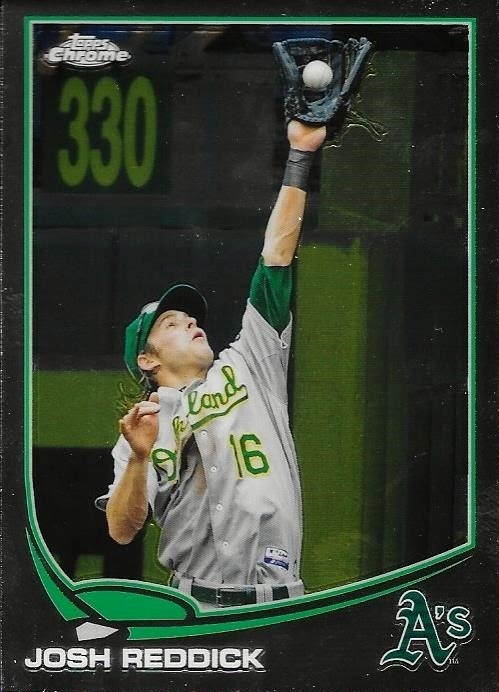 I completed a trade with my new friend, Scott F., when I sent him a nice Madison Bumgarner auto from Tristar Prospects Plus in exchange for 31 Topps Chrome cards I needed for my set and also 5 2013 Topps emerald parallels for that set. The 2014 Chromes made a huge dent in what I needed in order to complete my set. I'd like to get that one complete pretty soon as well. Completing the 2013 emerald set is another matter in itself. This one has slowed down quite a bit. I need to find some dealers at shows who have these available, but I haven't been all that aggressive in looking. I'll get it done sometime, though. When I do, I fully intend on putting these in an album, as opposed to how I normally store my sets, in long boxes. Scott also sent some nice parallels and a couple autos, one of which will be sent to a friend of mine soon. The other cards he sent, I'll put them aside and show them in a later post. Thanks for the trade, Scott! 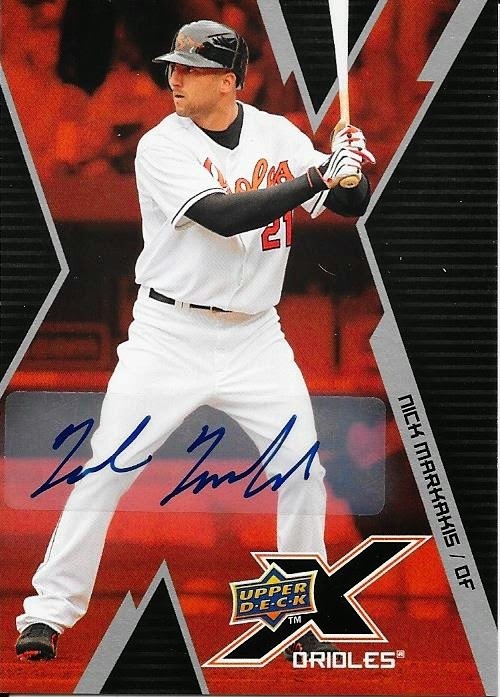 I completed a trade with a new trade partner from Instagram recently when I picked up this 2009 Upper Deck X Nick Markakis auto in exchange for a Chris Johnson orange die cut card and a few other cards. The person I traded with was a kid named Caleb who goes by the Instagram name @cardman102_youtube and also is on Youtube as +CardMan102 . Caleb is from NC, just like me, and his package got here really fast. Upper Deck X wasn't one of the best sets around, but wasn't nearly as bad as Upper Deck Biography or Topps Moments and Milestones. 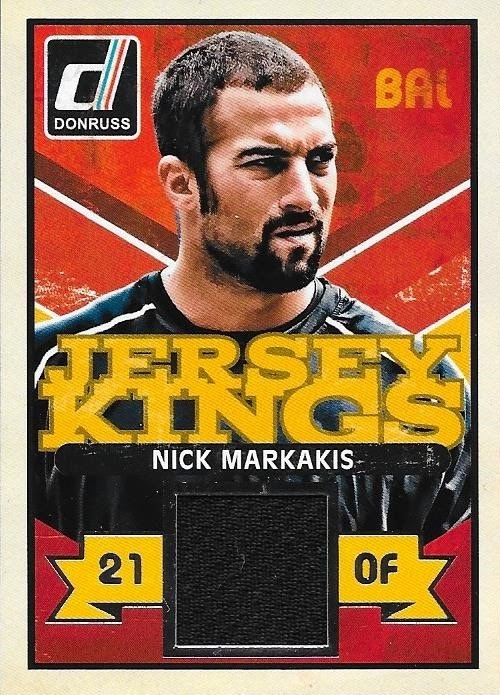 I don't have a whole lot of Markakis autos, so this one definitely fits well into my PC. I'm hoping Nick signs with the O's soon, and I think he will. I can't imagine him in another uniform. Thanks for the cards and the deal, Caleb! Everyone, go and check out Caleb's Youtube channel and his Instagram account. 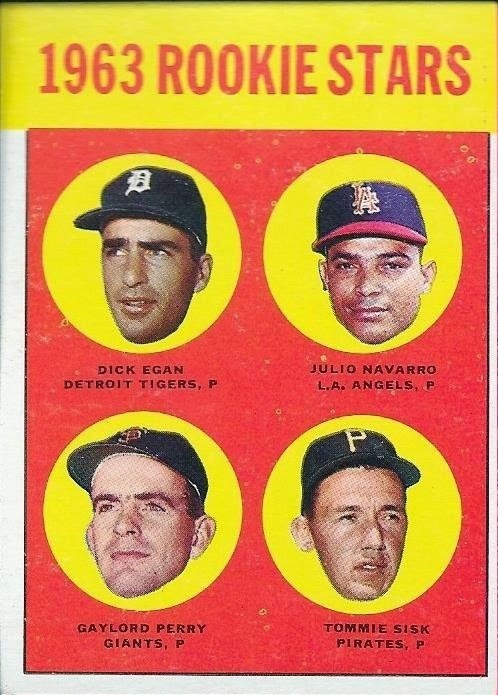 Another high numbered All Star has been removed from my needs list for 1959 Topps. I picked up this Hank Aaron for $25 on Ebay after watching a few lower grade ones go by. I wanted to go ahead and pick one up and liked the deal I got on this one. It is in great shape, so I feel like I did a good job. This card puts me at 93 cards to go for my set. I really believe I can get it wrapped up soon. I'm watching a few other All Stars and will probably make a huge dent in the list at the next card show I go to (probably later this winter, more toward spring). 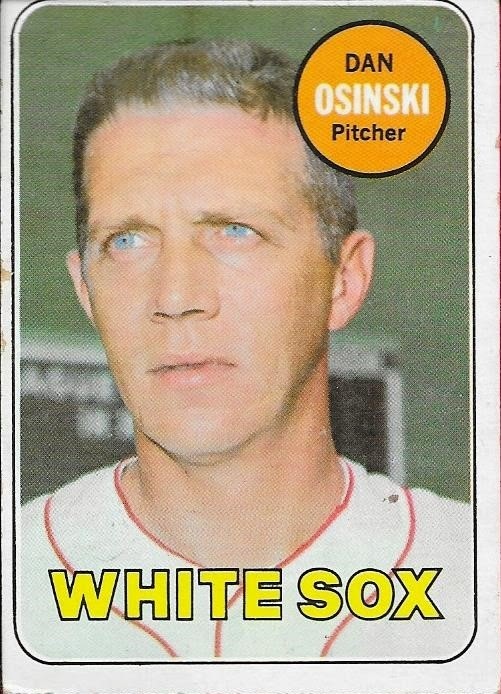 When this set is done, I will concentrate harder on the 1969 set and I will also officially begin (even though I've been chipping away at some cards already) the 1967 set. I got a nice deal on this 2014 Topps Nolan Reimold camo parallel on Sportlots for $2.00 plus shipping. I had seen some of these go for $19.99 BIN on Ebay, which I'm glad I passed on. I'm usually really bad about jumping on the first cards I see, but luckily, I forgot to pick one up earlier this year, and it paid off. This card is numbered 82/99 and is obviously in great shape. I still can't believe I got it for $2.00. If only I could find a black parallel for that cheap. Or even a platinum... yeah right. Nolan is a free agent at the moment, but I figure he will sign a deal with someone this offseason. If he can stay healthy, some team, somewhere, is going to get a deal. Good luck Nolan! In my huge package that I got from Max the other day, he included a great vintage card that I didn't have in this 1963 Topps Stan Musial. 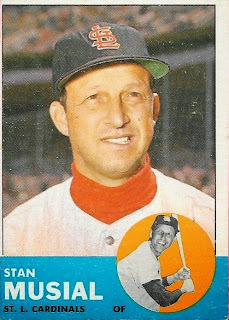 This was Musial's final regular Topps card. It is a bit off center, but otherwise in great shape. I really appreciate that Max included this card because I really wanted one, but hadn't ever jumped on it. Thankfully, I don't have to, now. I have Musial's RC (1948 Bowman) his 1953 Bowman and his 1959, 1960 and 1963 Topps cards. Not too bad! Thanks for the card, Max! I knocked off a bunch of set needs from Sportlots recently when I picked up several cards for 1959 and 1997 Topps, 2013 Topps Chrome and 2014 Topps Update. I made the biggest dent in my 1997 set (which I still haven't posted my needs on my wishlist, but I plan on getting around to it, I promise). 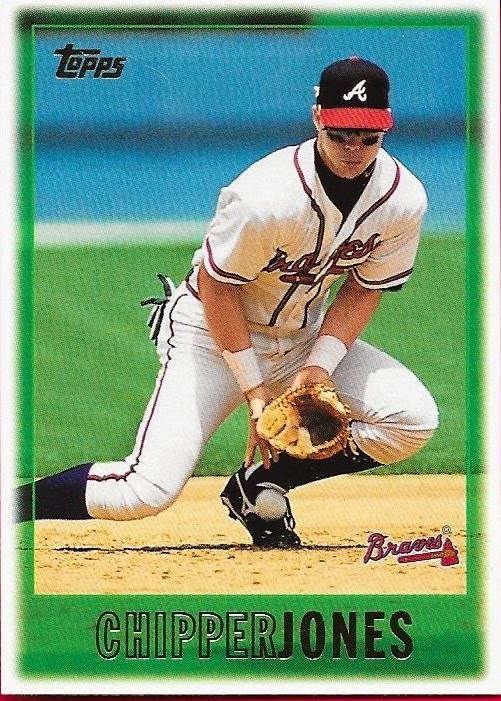 I got 40 cards that I needed, the most prominent ones being this Chipper Jones and also Greg Maddux. I like this set, but I have really neglected completing it since I have been concentrating on 1959 and 1969. I plan on finishing this up really soon so it will be out of the way, then all I will need to finish from the 90s will be 1994 and 1995. 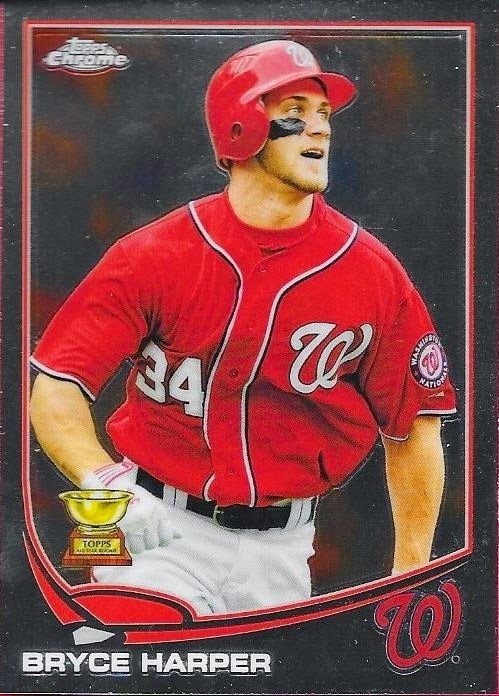 Another set I completely neglected was 2013 Topps Chrome. I just stopped looking for them right after they came out and the box has been languishing in my closet. My intention was to complete this set (and also 2014 Topps Update), but one Sportlots seller apparently failed to send multiple orders so everything I requested from him was canceled. This means that my 2013 Chrome and 2014 Update set completions will have to wait. I also added 3 1959 Topps cards that I needed, bringing me down to 94 that I need for completion. Those high numbers are still tough, but I got the biggest ones out of the way with the Mickey Mantle and Willie Mays All Stars. Maybe in the coming weeks you'll see that I actually finished a couple of these sets. Man, I hope so, because I need to relocate some of these set boxes so I can move others in their place. 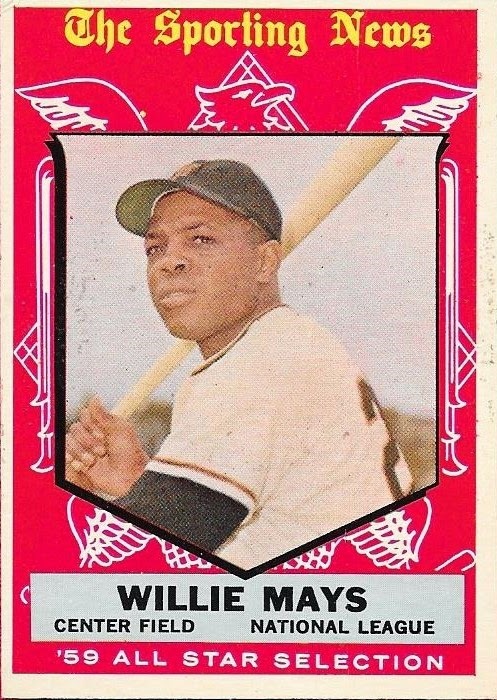 I added another huge piece to my 1959 Topps set when this awesome Willie Mays came in yesterday. I got it at a great price and as you can see, it is in amazing shape. 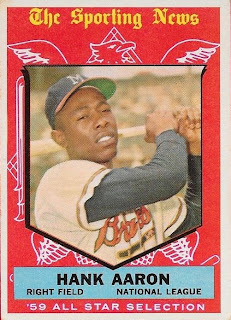 I'm currently watching a Hank Aaron for a good price that is ending today, so if I get that, I'll have three of the major All Stars already. Adding the Mays will leave me needing 97 cards to finish my set. I would really like to complete this set soon, and I feel like I can do it. It has become quite obvious who my favorite trading partner on Instagram is. Not to take away from anyone else on there that I trade with, but Max has become one of my closest friends in the trading community. 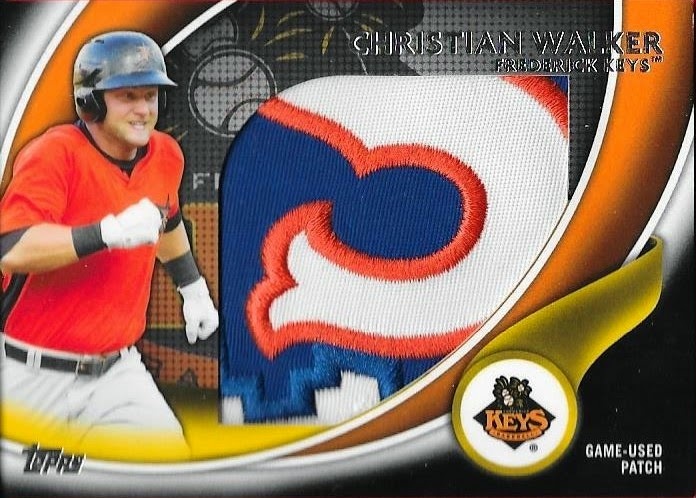 When I picked up the Orval Overall T-205 card for him, I had every intention of just giving it to him for free but he offered me this awesome Christian Walker patch from 2014 Topps Pro Debut. The card is just awesome. I like Walker, not only because he is an Oriole but because I got to see him play for the University of South Carolina back when he was in college. The card is numbered 2/5 and Max really could have asked for the moon on this one. Luckily, he was so excited to get the Overall tobacco card, that he wanted to send this for it. I have every intention of sending Max more good stuff with this trade in mind, but I already do that anyway. He and I are now at the point where we just send each other stuff that we thing the other would like, which works out the best, I think. I'm really happy that Max kept me in mind when he found this card. It meant a lot to me that he made sure it ended up in my PC. He also included an amazing letter to me in the deal, and a lot of other stuff. He send so much other stuff, I'll have to show it in subsequent posts. Stay tuned! Very rarely do I post a card that I know will not be headed to my PC. 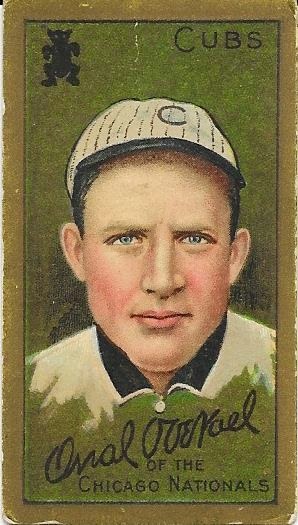 I purchased this 1911 T-205 Orval Overall card as a gift for my good friend and Cubs fan, Max. I saw the card and price it had been set at, and picked it up for him. He had told me that his oldest card was a 1933 Goudey and I wanted to see if I could do better. I feel like I did. As it turned out, Max wouldn't let me send him this card for free. He offered up an awesome trade piece, which I should be receiving very soon. I really enjoy sending random cards to my friends, and I had a lot of fun finding this one for him. I know he will enjoy it. Overall (b. 1881 - d. 1947) played in the majors from 1905 to 1910 and 1913 for the Reds and Cubs. His overall (see what I did there?) career record was 108-71 with 935 strikeouts and a career ERA of 2.23. He was a very good pitcher for his brief career, winning 20 or more games in a season twice and finishing with an ERA below 2.00 3 times. His career was too short for him to be included in consideration for the Hall of Fame, however, an argument may be made for him. Something else that I think Max will enjoy is that he will now own a baseball card that was printed during a player's career who actually won a World Series with the Cubs! Overall won twice with the Cubs, in 1907 and 1908. I thought that was really cool. I hope he does as well. By the way, the card is a Sweet Caporal back. 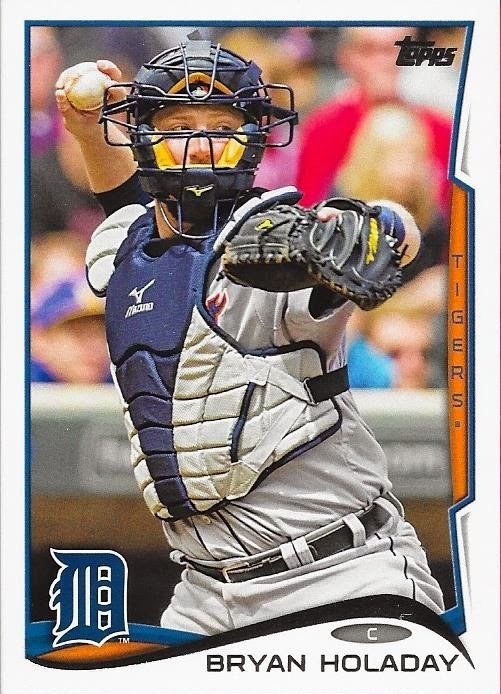 Yeah, you know you don't have any good mail coming in when all you can post is a Topps Update card of the Tigers' backup catcher. Yet, here I am. Not a lot of mail coming in because I had several trades fall through, either by cards not being delivered or people not sending payment like they said they would. What a shame. Anyway, to try to combat this problem, I went on Sportlots and tried to nail down some set needs in order to kind of pump up my mail days. My goal was to complete my 2013 Topps Chrome and 2014 Topps Update sets and also chip away at some other sets. 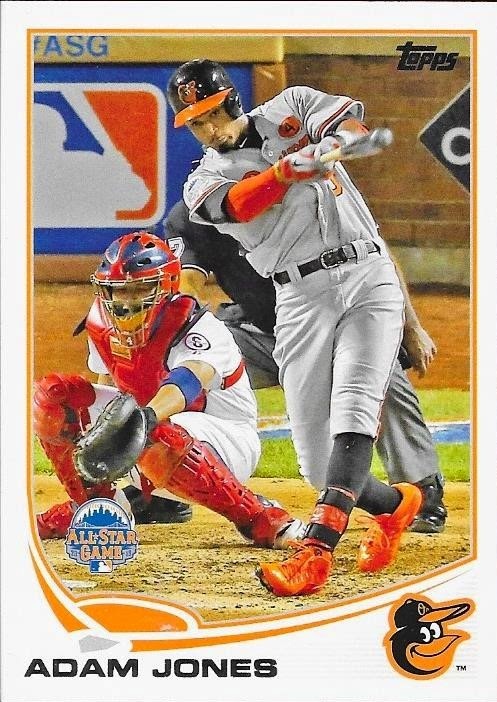 For some reason, this Bryan Holaday was not among the cards I could pick up off of Sportlots, so I had to get it off of Ebay instead (at $1.00, supply and demand, my friends). I wonder why there was a shortage on this card? Anyway, I have it and I will now await the other cards from my purchase to come in, hopefully tomorrow. I completed a trade with a guy named James on Instagram who's handle is @sportscards10. I have completed a few trades with James already and this one was just as easy. All I had to do was pick up an Andrew Luck 2-color patch for him off of Ebay (since his Ebay doesn't work) and send it to him. 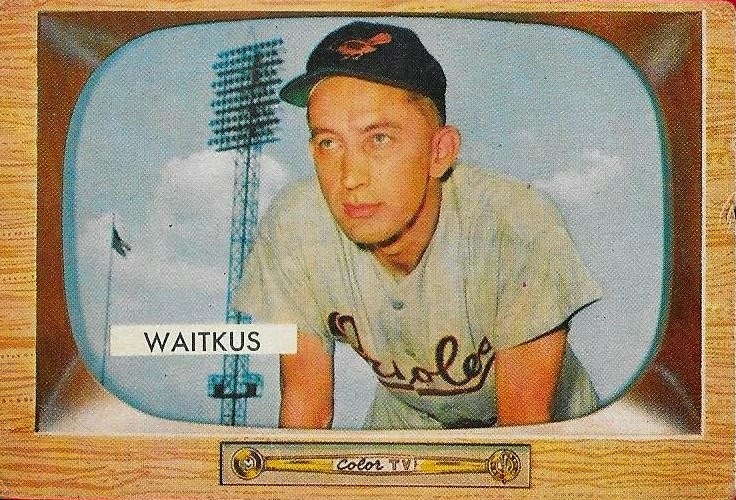 He offered me a bunch of Orioles cards, but the highlights of the deal were these 1955 Bowman cards of Eddie Waitkus and Don Johnson. 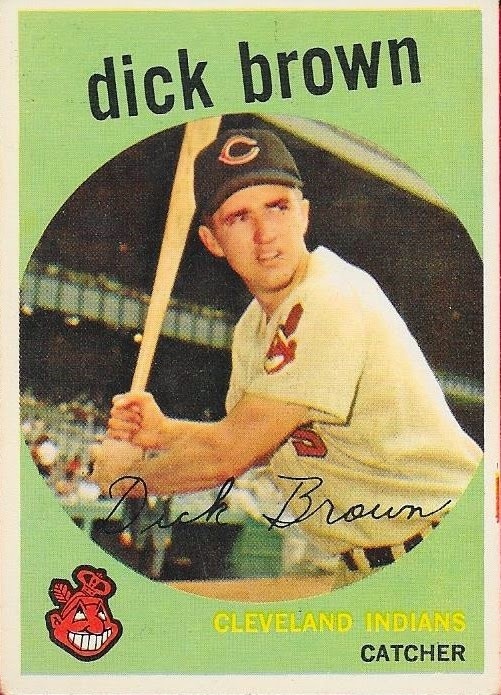 I have always liked 1955 Bowman (and when James showed me these were in the deal, I jumped on Ebay and bought the card he wanted, no questions asked). This set is one of those sets that I want to give serious consideration to completing once I finish 1948 Bowman. I like to have a few irons in the fire, so to speak. Thanks for the deal, James. I also want to thank you for your kind words in the letter that you sent, as well. It means a lot to me and I enjoy getting the letters as much as I enjoy getting the cards! They say pitching and defense wins ballgames, and the Orioles again showed that their defense is superior in the American League tonight when three of their players took home some hardware. Nick Markakis (above) won his second Rawlings Gold Glove award when he was named the AL winner for Right field. Markakis beat out Kole Calhoun of the Angels and Kevin Kiermeier of the Rays. Adam Jones won his 4th Gold Glove when he beat out Jackie Bradley, Jr of the Red Sox and Adam Eaton of the White Sox. I'm surprised that Mike Trout wasn't birthed with this award, since all of the baseball pundits feel that he is the greatest player alive. 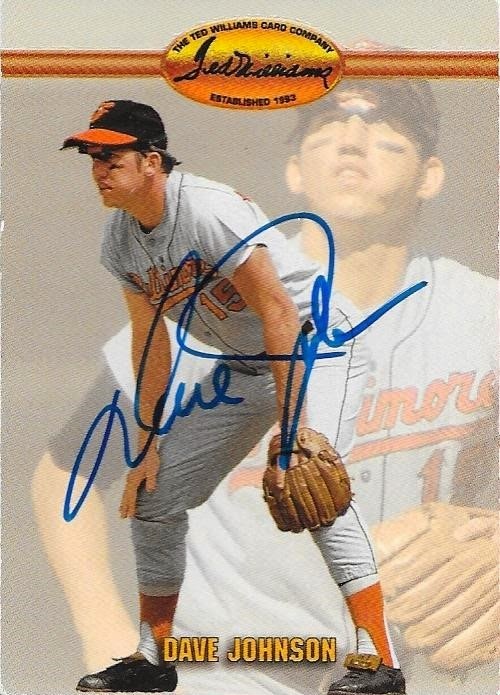 Jones is now tied for third All-Time on the Orioles (with Mike Mussina, Jim Palmer and Bobby Grich) with 4 wins. 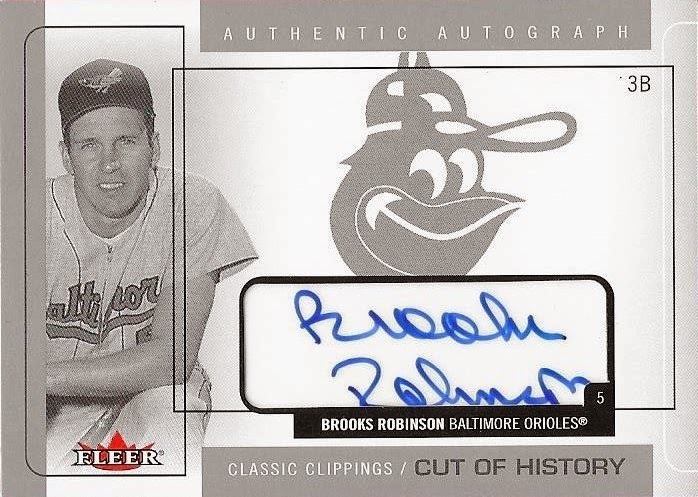 Brooks Robinson has the Orioles All-Time lead with 16, followed by a tie between Paul Blair and Mark Belanger with 8 each. 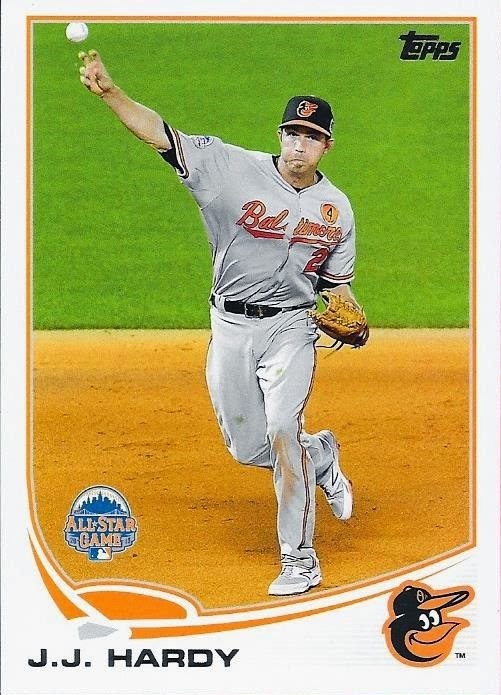 Finally, shortstop J. J. Hardy won his third straight Gold Glove tonight when he beat Alcides Escobar of the Royals and Alexei Ramirez of the White Sox. Hardy and Jones have won three straight gold gloves as teammates. I made a quick and easy deal on Kik with Anthony the other day when I bought this 2014 Topps Stadium Club Jonathan Schoop auto off of him for only $3 shipped. He gave me such a deal on this card, I couldn't pass it up. Schoop (pronounced - SCOPE) had a decent year this year and showed that as he develops, he will have a great deal of pop as well as a great glove at second base. The auto is on card and the shot of him is pretty cool. I was happy to hear that Topps was bringing back Stadium Club this year. The last offering they did was in 2008, a set which I really enjoyed. I haven't been able to pick up too many packs of Stadium Club, but when I have been able to, I have been really happy with what I've gotten. Thanks for the deal, Anthony! 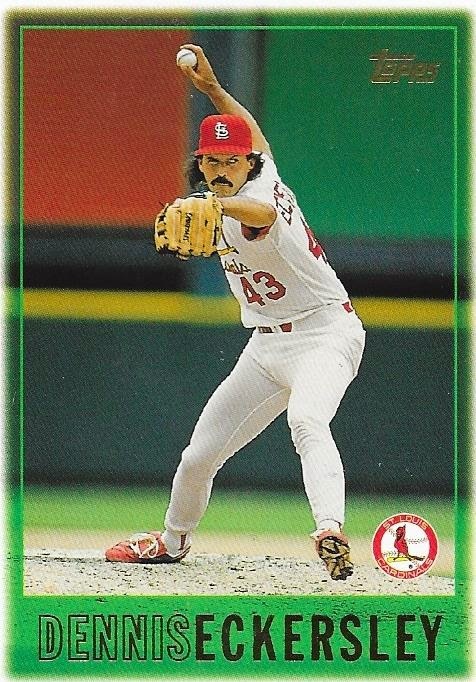 These are slow times over here, as far as cards are concerned. I haven't bought anything for myself off of Ebay recently. The only things I HAVE bought are cards for other people, If I didn't want most of them to be surprises, I would probably start blogging those, but no, I want to stick to my stuff. This kind of happens, though, you kind of get complacent and don't do a lot of deals all at once, or you do them, and it takes forever for folks to send. This is my real problem at the moment. People are slow to send. I bought a few cards off of some people recently, and I'm still waiting with anticipation by my mailbox, yet nothing comes. Might start asking for refunds soon. Anyway, one thing that never fails me is my local card shop. Although, today's trip to the shop had me buying loose cards for friends, and none for myself. I also bought some packs for Chris. I did, however, get myself a few packs, and they didn't disappoint. 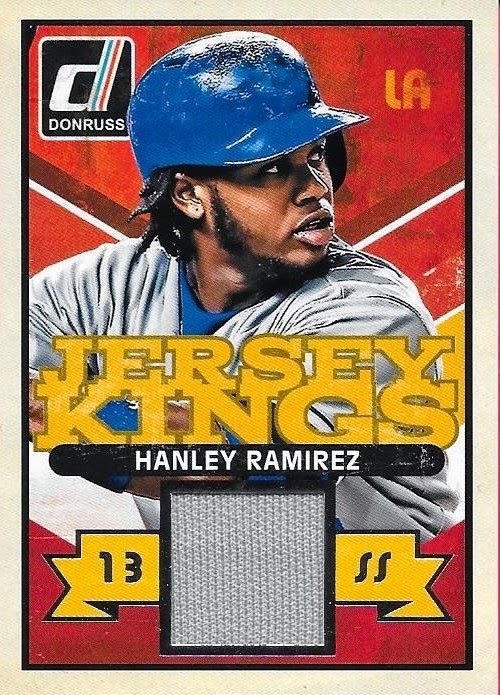 I picked up two packs of 2014 Donruss Series 2 and pulled a nice relic card, the above Hanley Ramirez. It isn't a patch like Chris's card, but it is still nice. 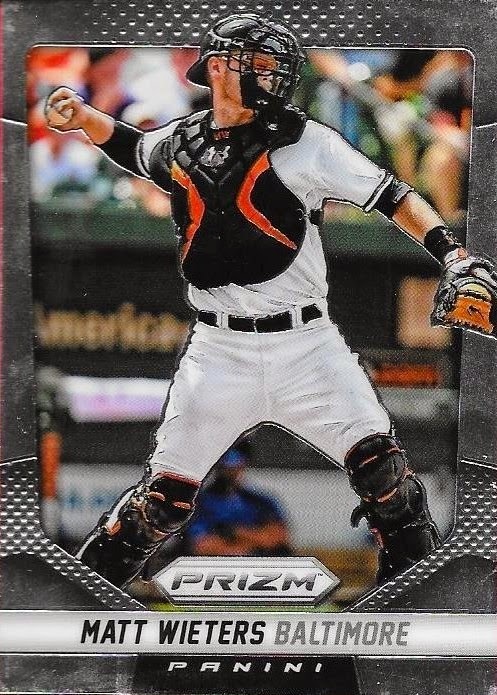 I also got a pack of 2014 Panini Prizm and pulled this nice Matt Wieters card. What's with the powder stuff that they put in the packs of these? Kind of odd. 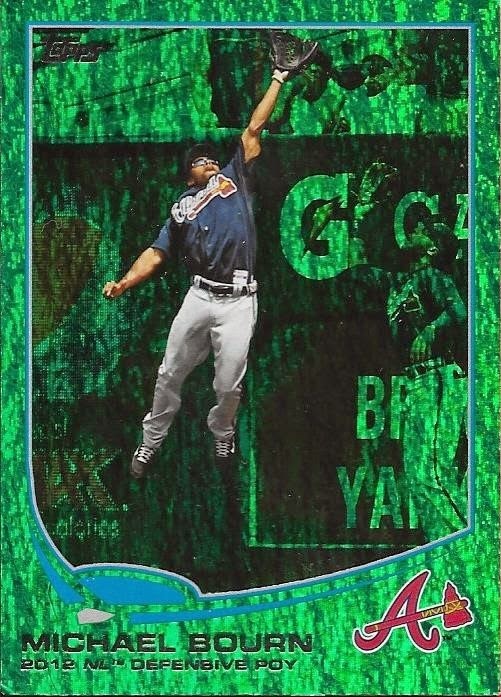 Anyway, I probably will be hitting sportlots and Ebay soon, that should pull me out of this card slump pretty quickly.